Soon after I published Food As Medicine in 2011, I received an email from a reader, who wrote about her experience with migraines and magnesium. A long-time lacto-ovo vegetarian, she told me that she took supplemental magnesium each month to control her premenstrual migraines, and that it was the only thing that worked for her. To be sure, it’s been known for years that magnesium can be helpful in the prevention of premenstrual migraines. Several studies have shown that low serum magnesium is an independent risk factor for migraine headaches, and that magnesium can be used therapeutically to both prevent and treat migraines, as well as a host of other disorders characterized by spasm. She couldn’t understand why she might be magnesium-deficient, however, because she ate a lot of brown rice, and had been told that brown rice was high in magnesium. According to nutritiondata.com, rice indeed tops the list of all magnesium-containing foods, at 781 mg per 100 mg. Although this refers specifically to just the bran and not the whole grain cereal itself, brown rice still weighs in at a respectable 143 mg of magnesium per 100 g serving. Thus if she ate about three cups of cooked brown rice (about 550 g) on a daily basis, she should have been getting more than 780 mg of magnesium, which is a significant dose by any standard. It was only after this woman read the sections in Food As Medicine that discuss the importance of fermenting cereals to enhance nutrient absorption, that she put two and two together. Following the instructions in the book (see below), she began to ferment her brown rice before cooking, and a few weeks later noticed that she didn’t experience the same intensity of premenstrual migraines. Inspired by her results, she continued to practice this technique for the next two months, reporting to me in her email that her migraine issues were apparently resolved. 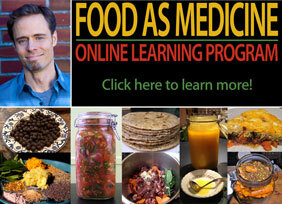 Any of my students enrolled in my Food As Medicine program won’t find this to be much of a surprise. One of the central tenets of my nutritional approach is that our issue with diet and its disease-causing potential is a direct result of industrial technologies supplanting traditional methods of food preparation. All seeds (or more properly ‘fruits’), whether they be cereals, legumes, nuts, or what conventionally call “seeds”, contain a host of natural plant chemicals that serve to discourage predation by animals. This is done to ensure reproductive success, and while this strategy isn’t necessarily effective against all predators, such as insects and birds, it has been very successful against mammalian predators. 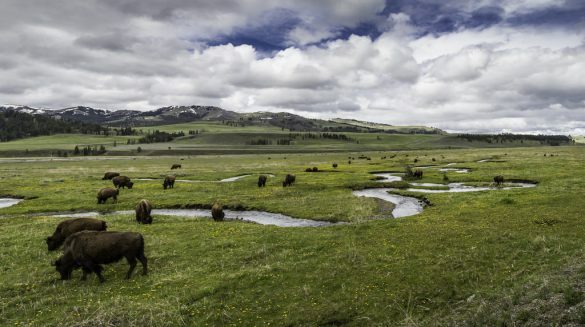 The extensive grasslands found all over the world are a testament to just how effectively grass seed resists mammalian digestion, and how the grass actually uses these predators to spread it further afield. Such is the strategy of many plants, that sacrifice a part of themselves to ensure the distribution of their genetic material, hopefully dispersed intact, contained within a nutrient-dense clump of “fertilizer”. Among mammals, however, humans are unique for our relatively recent practice of consuming cereal and legume crops as staples. While a variety of seeds have long been a part of the human diet, the proportion consumed for pre-agrarian peoples was much lower when compared to the farming folk that began to emerge during the 9-10th millennia BCE. 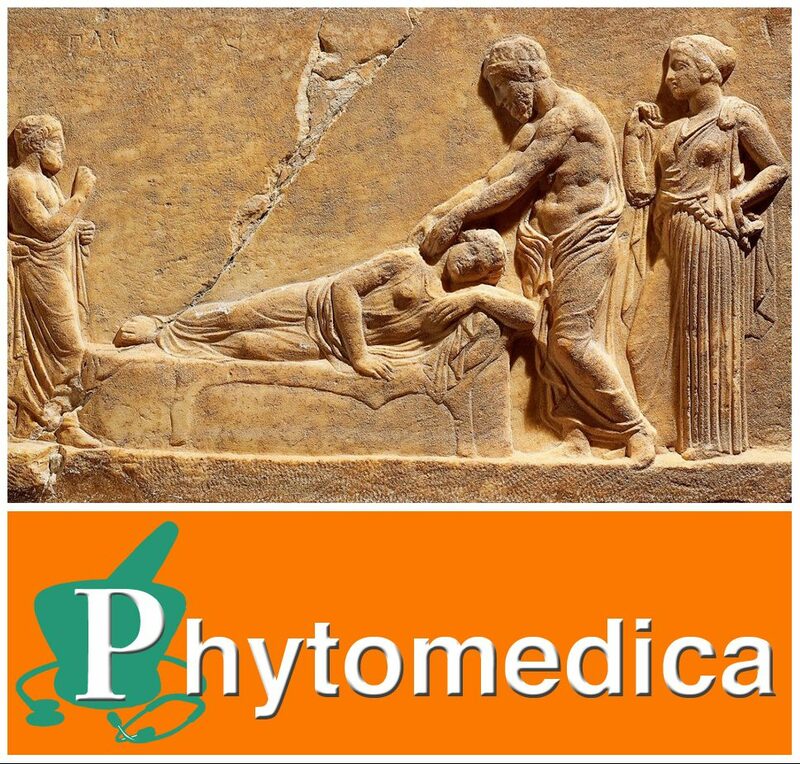 The archeological record shows that in every measurable way human health declined with this transition, with clear evidence of physical degeneration, including a loss of height and bone density, and a dramatic increase in dental and skeletal problems. 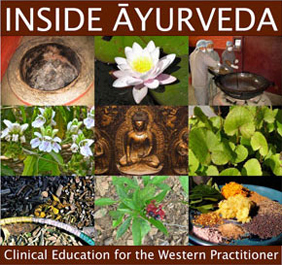 While this issue of diet and physical degeneration remains perennial throughout the history of human agriculture, the problem stabilizes and begins to reverse as early farming societies discovered the importance of using food preparation techniques such as fermentation, to increase digestibility and nutrient absorption. Since this time, traditional agricultural societies have maintained an unbroken practice of using such techniques to process cereals and legumes, and optimize health. 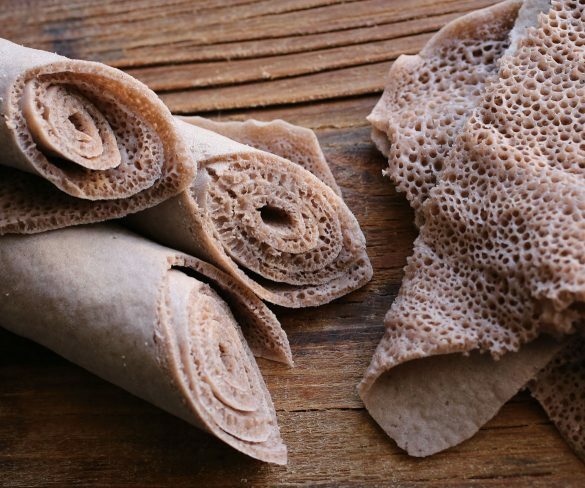 Besides the traditional sourdough breads of Europe, examples of this can be seen all over the world, in traditional foods such as chocolate (from cacao, Central America), ogi (from sorghum, West Africa), injera (from teff, East Africa; pictured below), idli (from rice and urad, South India), and natto (from soy, Japan). As I articulated earlier, the global exportation of industrial food technologies has meant that much of this knowledge is rapidly disappearing or has been lost entirely. In all of the regions I mention above, industry has either begun to or has entirely supplanted these traditions, as it has in Westernized, ‘First-world’ nations. As a result, we can see how Westernized patterns of disease have crept into these societies, to promote an increasing prevalence of digestive, cardiometabolic, and autoimmune disease. Billions and billions of research dollars are spent each year trying to find a cure for these diseases, when in many cases the cause is entirely related to a loss of traditional knowledge and practices. In 2011, I made the point in Food As Medicine that when wheat is properly fermented, it no longer elicits an immunological reaction in patients diagnosed with celiac disease. This demonstrates that the cause of celiac disease is directly related to a failure to maintain traditional food practices. In my opinion, this finding is just the tip of the iceberg in a huge range of digestive and inflammatory disorders that could otherwise be prevented. Of course this epiphany for the most part continues to elude modern science, which due to monied interests and its myopic pursuit speculative, novel solutions, has little time for moldy old traditions like food fermentation. But in my clinical experience, and as demonstrated by this woman’s experience with brown rice, we continue to ignore traditional wisdom at the peril of chronic disease. Fermentation is a key step in ensuring the digestibility of foods such as cereals, legumes, nuts and seeds all of which contain antinutrient factors (ANFs) such as phytic acid and trypsin inhibitors that impair digestion and inhibit the absorption of nutrients. The procedure to ferment these foods begins with making a starter. Soak the nut, seed, grain or legume in water for 24 hours at 86˚F/30˚C, in a ceramic or glass container. If you don’t live in a tropical climate you will need to use something to keep the ferment warm enough, such as an electric heat mat used for sprouting and germinating seeds. After 24 hours, drain off the liquid, but set aside one cup of the soaking water for later use. Rinse the nut, seed, grain or legume, and prepare as normal. The cup of soaking liquid that you reserved is full of bacteria, and becomes an inoculum (bacterial culture) for the next batch. Repeat the same process with fresh ingredients, but add the inoculum to the soaking water, and let sit at 86˚F/30˚C for 24 hours. After, drain the soaking water and cook as normal, but retain a cup of the soaking water for the next batch. If you keep doing this, by the fourth time you will have an inoculum that is capable of reducing ANFs such as phytic acid by 96%. While fermentation reduces ANFs, however, it does not remove components such as lectins, and thus the nut, seed, grain or legume usually requires additional measures such as cooking. 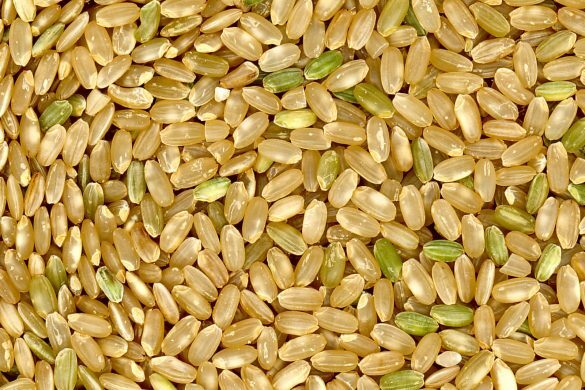 Once you have created a viable inoculum, you can store it in a covered vessel the refrigerator for up to a week before it will die, but add a handful of brown rice to give it some food. So try it out… whether you ferment before or after cooking, doing so will go a long way to improve gut health, and diminish chronic inflammation. When the Ox god arrived on earth, he called all the people to him, and told them that the Emperor of Heaven said that if they work hard they can produce enough food to eat three times a day. The starving people were overjoyed with the news, and the Ox god feeling happy and satisfied, flew back to Heaven. When he arrived, however, the Emperor was furious. “Why did you tell the people to eat three times a day?” the Emperor glared at the Ox god. “That is more food than they can produce by themselves!” So as punishment for his grievous error, the Emperor sent the Ox god back down to earth, and compelled him to become a plough animal, to till the soil so the people could plant enough food to eat three times daily. In Ayurveda too we also find a similar idea, that it is better to eat less food, less frequently, suggesting that if we are otherwise healthy, we should only need to eat twice daily. This is also reflective of the dietary pattern of pre-agrarian peoples, including the First Nations and other indigenous peoples that traditionally subsisted on hunting and gathering, observing a morning and late afternoon meal. And despite the oft-repeated recommendation by modern nutritionists, to eat 5-6 small meals a day, the science demonstrates exactly the opposite, suggesting that eating less food, less frequently appears to enhance longevity. This research has sparked a lot of interest in the subject of intermittent fasting. While I continue to view the calorie-model of nutrition as overtly simplistic, there are some basic principles of physics at work here. The notion that acquiring food energy in excess of our metabolic need for it – whether its a protein, fat or carbohydrate – will cause metabolic problems such as obesity and diabetes isn’t at issue here. But what are we to make of a recently published study, widely reported in the media, suggesting that meat consumption is specifically at play? In the present study, the link between meat consumption and disease risk probably has less to do with diet than with health consciousness generally. For example, people that consciously eat more vegetables are more likely to be health aware over all, drinking less alcohol, not smoking, and taking care to get regular exercise. In fact, when these variables are taken into account, the paper in JAMA suggests as much, stating that “these associations were confined to participants with at least 1 unhealthy lifestyle factor based on smoking, heavy alcohol intake, overweight or obesity, and physical inactivity, but not evident among those without any of these risk factors.” This is apart from the fact that the purported risk from consuming a 10% increase in animal protein intake is linked to a 2% increase in overall mortality, which is by any measure, statistically insignificant. Unlike the specious conclusions of this kind of armchair research so widely reported in the media, when researchers actually roll up their sleeves and conduct clinical research, the results they report are consistently contradictory. 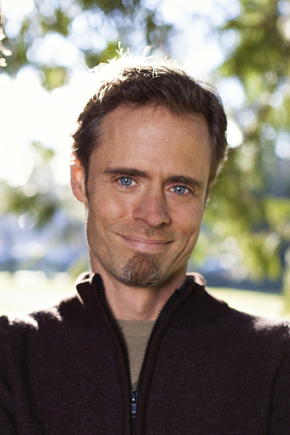 This type of research, which is the gold standard when it comes to scientific validation, demonstrates that diets rich in animal products confers a metabolic advantage over the alternatives, decreasing the risk of obesity, diabetes, cardiovascular disease, and dementia, consistently out-performing high carbohydrate diets. This evidence is further bolstered by a huge body of frequently ignored evidence demonstrating a clear link between metabolic issues such as obesity, and excess sugar/carbohydrate consumption. This correlation between carbohydrates and metabolic issues is so powerful that even following a healthy lifestyle pattern, such as regular exercise, isn’t sufficient to ameliorate its effects. Thus if you want to dramatically reduce your risk factors for disease, reduce the amount sugar and simple carbohydrates in your diet – and don’t worry about the animal products. I began this piece today by talking about meal time frequency, relating the Chinese legend of Ox god messing up the instructions given to him by the Emperor of Heaven. So please don’t think that while I advocate for continuing to include animal produce in the diet, as humanity has for millions of years, that I am talking about over-eating. In fact, the way I get people to eat LESS in their diet, is by eating MORE fat and protein in the morning for breakfast, eating very little or nothing during the day, and enjoying a lighter, carbohydrate-rich meal for supper. As the saying goes, “breakfast like a king, dine like a pauper.” I discuss this dietary pattern in greater detail in an earlier blog on breakfast, and it remains one of the most important recommendations I can make to improve both physical and mental health. By the way, there’s also no reason why this same approach can’t be undertaken in a vegetarian diet. I have had several patients over the years for whom this was a dietary restriction. As long as they were comfortable eating dairy and/or eggs, it is something I can work it. There’s also precedent for the practice of a low-carbohydrate breakfast in India, unlike the sweet foods that most eat today. For example, drinking large amounts of dahi (fresh liquid yogurt) was a traditional breakfast food eaten in the Punjab. Likewise in the south of India, a fermented steamed rice cake, traditionally made partially milled rice and urad dal, was eaten with a spicy vegetable lentil soup and generous mounds of fat-rich coconut chutney. Eating this way is also more appropriate in warmer climates, and during warm seasons, where animal foods aren’t required to the same degree to maintain the natural heat of the body. 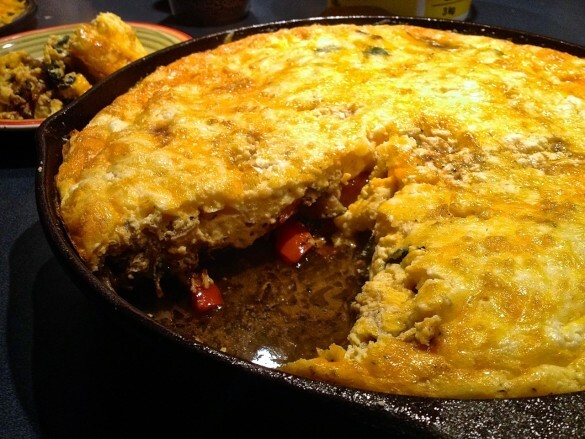 While the word ‘frittata’ is new for many people in North America, it is just one name among many different regional names for a dish that has been with humanity for a very long time. 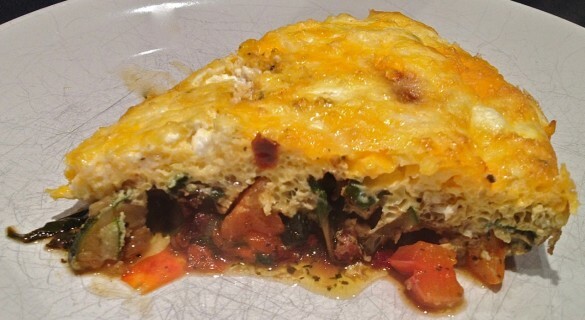 In essence, a frittata is an open face omelet that usually contains a mixture of vegetables and other ingredients cooked in a batter of scrambled eggs. There are some specific differences between a proper Italian frittata and other regional examples, such the Persian ‘kuku’, or the Arabic ‘ajjah’, but given our global culture I encourage you to experiment freely. Italian frittatas tend to have more egg relative to other ingredients, and are flipped over at some point during the cooking process, whereas both kuku and ajjah contain much less egg, and aren’t flipped over. Personally, I avoid flipping over a frittata because I dislike the crispy brown crust of overcooked egg. I often find myself making a frittata for my family when I was otherwise unprepared for making dinner. Nobody took any meat out to thaw in the morning, and now everyone is hungry. Well, as long as we have eggs, vegetables, and some nice ripened cheese, I can make my ‘egg pizza’ in less than 30 minutes, beginning to end. And it’s so good, even those who normally hate eggs will eat this up without complaint! optional: ½ – 1 cup crumbled/grated cheese, e.g. romano, parmesan, feta, etc. In a large cast iron pan at medium heat, add the butter or olive oil, and when it is hot, add the dried herbs and garlic. Stir this for a minute or so, and before the garlic changes color, add the onions and green pepper. Sauté the vegetables just until the onions become translucent, then add the zucchini and sauté this for a couple minutes. Add the scrambled eggs and turn down the heat down to low. Distribute the chopped tomato and black olives across the surface of the pan, and cover with cheese. If you have an oven, place the pan in a preheated oven at 350˚F/175˚C for 15-30 minutes, or until the eggs have completely risen, but before the surface browns too much. For variation, throw in some nice Italian chorizo, the leftover bacon from breakfast, or smoked salmon just before you add the eggs. If you don’t have an oven, you can also make this on the stove-top, by using a tight-fitting lid, and keeping the heat low so it doesn’t burn. 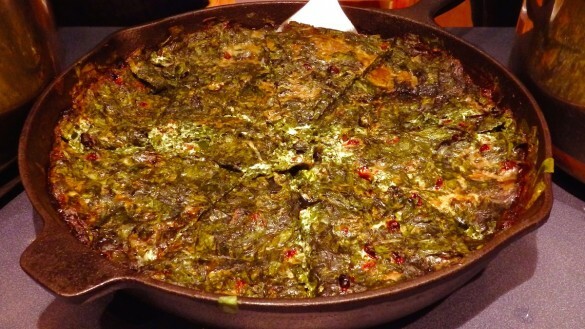 In Iran, ‘kuku sabzi’ is made in a similar fashion, using garlic or shallots, fried in ghee, later adding about four cups of chopped greens such as spinach, parsley, leek, cilantro and dill. Only half a dozen eggs or less are used when making kuku sabzi, just enough egg to bind it so it looks like a green frittata when it’s done. Top it with fresh crushed walnuts and a few barberries before serving.